I must confess…this is the bloodiest trailer I’ve ever seen outside the buckets of blood stuff from the 80s and 90s with Freddy and Jason etc. This entry was posted in Movie Reviews, Uncategorized and tagged Action, Alien, alien: covenant, horror, movie, movies, Sci Fi, Science Fiction, SciFi. Nothing big to announce…other than I finished my second book. Yeah. Finally. After a bunch of things getting in the way (things called “life”) I now have book 2 done. The Bellerophon: Flight will be available on Amazon.com hopefully by the end of the month. I’m just waiting for cover artist Kevin Reyonlds to send me a cover and it’ll be uploaded shortly thereafter. Look for Bellerophon: Flight to be out soon and look for it to also be bundled with my first book Bellerophon: Ambush for a savings if you want to pick up the first two books in what will be a series of 4-6 books (not counting spin-offs). Thanks so much for your patience and I’ll get back to whatever it is that I do. This entry was posted in Dailies and Writing Updates, Uncategorized and tagged amazon.com, Bellerophon, Captive Galaxy, eBook, eBook Download, kindle, Kindle Unlimited, kindleunlimited, Sci Fi, Science Fiction, SciFi, Writing. …the Falcon has been stored on the desert planet that is home to the tough living Rey (Daisy Ridley). It has been stored there for several reasons that I will get into in a moment. In the most recent trailer the Falcon is being chased by tie fighters and during the fight the much beloved craft of the original trilogy daringly flies through the wreckage of the crashed star destroyer. Now, that would seem a crazy maneuver, one that is certainly against all odds (I won’t quote those odds of course) that is, unless the pilot was aware of the layout of the crashed destroyer and knew there was a way out and not just durasteel bulkheads waiting at the end of what would be a short flight. Now why was the Falcon hidden away and why do I think it was hidden in the first place? Well, here come my spoiler predictions. BEWARE!!! Episode VII starts 30 years or so after Return of the Jedi. Things didn’t go so well for the Rebellion after the death of the Emperor, Vader, and destruction of the latest iteration of the Death Star. Why? Because the Empire was…well it was an empire. A big, big empire with many huge warships and millions and millions of troops. They weren’t going to surrender and go home so easily now would they? I why should they? It wouldn’t make sense. They still outnumber the rebels tremendously and don’t need to make decisions based on morals and feelings like the good guys do. In the wake of the loss the emperor the remaining Empire leadership got together and likely said: “probably be a good idea to kill that Luke guy, Sole, and Leia about now, you all agree?” So assassin squids are sent out. Bounties are set and no kidding this time. Bring me Han’s head and you get a planet…because we have a million to spare. Seems a worthwhile transaction in my estimation. The Rebellion was still pretty small so they can’t protect all their people all the time. There were probably some higher ups that got snugged. Akbar probably didn’t see that it was a trap at least once (by the way it’s not helpful to say “it’s a trap” after its been sprung). Luke probably saw that by staying close to his friends they would be put in danger so he may keep to his own little solo missions because he’s no general…he does pretty dumb and selfish stuff after all. SO of course Luke goes off and becomes corrupted by the dark side like Yoda warned. Which was why we didn’t see him in the last trailer. If you saw he was a bad guy there would be a missing twist opportunity. Han and Leia on the other hand have a couple kids. A boy and a girl. They’re a happy family but they find that there is a bad guy(s) out their hunting them and knocking off the few jedi that have come out of the woodwork with the demise of Vader. They decide to have older brother fool with the memories of his little sister and pretty much brainwash her into forgetting who she is, her jedi abilities, and who her family is. She wasn’t a fan of this but she didn’t want her family to be hurt so she went with it. She is hidden off on a desert planet (somewhat like the planet where her uncle was hidden away on except this one has only one sun) and so she, Rey, lives her lonely life in the desert taking refuge in a home made from a destroyed AT-AT with her time spent tinkering on machinery (like her grandfather Vader), scrounging the battlefield littered with star destroyers and other downed craft, while working for some alien I expect to be Maz Kanata (Lupita Nyong’o). All the while Rey is having these feelings that something is missing…cases of déjà vu are rampant etc. She says at some point “I am no one” despite the fact that she is an uber jedi in waiting. Rey is not the only valuable hidden away on the desert planet…the Falcon is also hidden away on the planet because it’s like a beacon strobe that says “HAN SOLO IS HERE.” That’s why in one of the short clips Han says “We’re home” and he looks relieved and nostalgic and then how he knows to fly through the downed star destroyer while being chased by a tie fighter. Okay so what about older brother that mind wiped little sister Rey? What happened to him you ask? 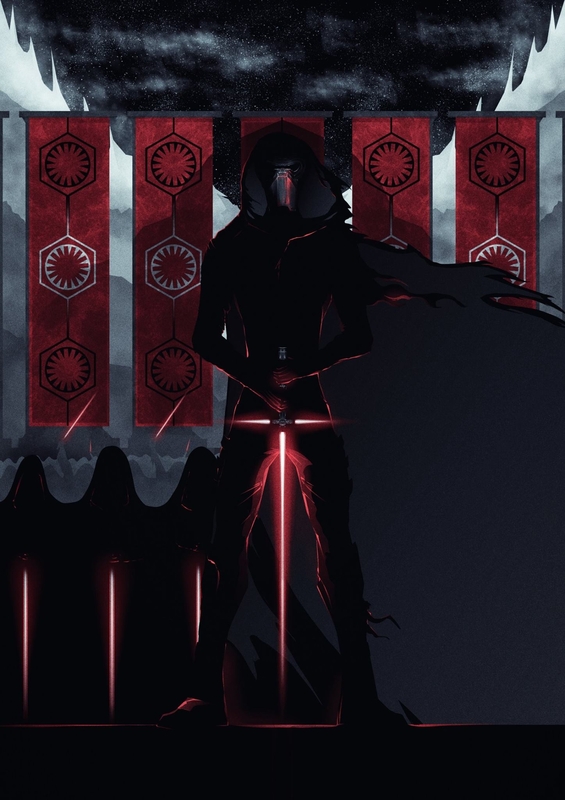 Well, in being older brother he felt that he would be able to protect himself and fight against those that were hunting him and his family (possible Uncle “dark side” Luke). It didn’t work out so well. He turns to the dark side himself and goes all naughty and jedi killy at the behest of his uncle. The galaxy needs order and only a nice sith working party can do that. They both, Ren and Luke, work to finish what Vader (grandpa and dad respectively) failed to do which was unite the galaxy and bring order; such a proud family. Now, just which major character dies? We need a worthy sacrifice and Jar-Jar won’t work (I think Jar-Jar is biding his time by the way and will make his move in Episode VIII by the way). Sorry Chewbacca but we’ll miss you. Our poor Wookie, perhaps the best “person” out of all the SW characters, will sacrifice himself and be slain by…probably Ren though I wouldn’t be surprised to hear it was Captain Phasma because she has to do something badass. Why else does she wear a shiny storm trooper outfit than to show off how tough she is? Oh, and about the character of Finn played by John Boyega? Well, he’s a storm trooper that’s becoming more and more upset that he is on the side of the bad guys but, like any gang, you just can’t walk away without being…well, killed. So, after participating in the opening scene massacre, a massacre led by Kylo Ren (and his Knights of Ren buddies) as they hunt jedi and resistance folks alike, Finn decides he’s done and it’s now time to get out. He jumps in a tie fighter, which of course all storm troopers can fly (perhaps he is special because he’s a secret jedi and can just do things…the jedi part is also a reason to leave because he’s part of a bunch of fellas hunting jedi and it’s probably not a great idea to stick around). He blasts his way out of the star destroyer and flies away and it’s all good until it isn’t and he gets shot down and crashes which brings the bad guys to the doorstep of Rey and that brings Han, Chewie, and Leia out of hiding to protect their kid against their other kid. Chase ensues for an hour and Chewie dies in a cold, dark forest or something like that. Don’t let me know if I’m right because I hate spoilers!!! This entry was posted in Day-to-Day Musings and tagged movie, movies, Sci Fi, Science Fiction, SciFi, spoilers, star wars, Star Wars VII, The Force Awakens.